Active, busy people often turn to processed, ready-to-eat foods for a quick meal or snack. It is true that today's working population may not have culinary skills or the time to chop or cook food, but are ready to eat food that is good for health. Routine consumption of packaged foods increases the salt, fat, and sugar content in the diet which can become a direct triggers for hypertension, diabetes, heart disease, and other health problems. Read the label on the packet, to check the ingredients which will be listed according to the decreasing levels in quantity in the food. So the main ingredient will be at the top and the lesser ones at the bottom. Trans fats are common in ready-to-eat and processed foods, non-butter spreads (margarine), biscuits, cereal bars, cakes, and bakery foods. Such fats can have devastating effects on the human body. Consumption of foods high in trans fats is the leading cause of clogged arteries, increase in total cholesterol, depletion of HDL (good cholesterol) that helps protect the heart. Sodium, present in salt and being necessary for human health, in large quantities is harmful. Instant foods like soups, chips, noodles, and canned foods, often have high amounts of sodium to impart flavor and preserve the food. High sodium intake can contribute to hypertension and heart disease. High fructose corn syrup, used in place of sugar, is a sweetener and preservative added to juices, breads, and cereals. Excessive intake of high fructose corn syrup can lead to obesity, diabetes, and heart disease. In addition to high fructose corn syrup and table sugar, some ready-to-eat foods also include artificial colors and sweeteners to make the products more appealing to consumers. 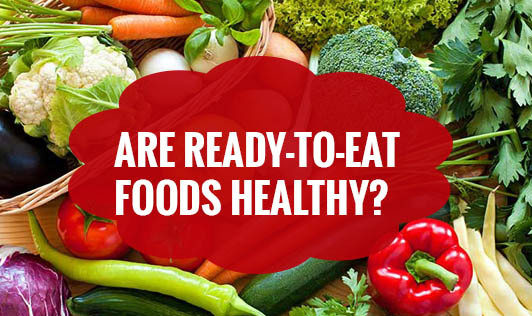 Though ready-to-eat foods are very easily available and convenient, they do not contain all the required vitamins and minerals that the body needs. So, eating freshly cooked food is a smarter choice. If this habit is inculcated from an early stage, it becomes easier to lead a long and healthy life!